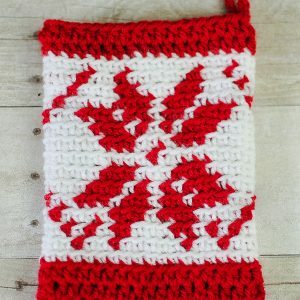 I have another Christmas stocking crochet pattern for you today … this pretty Fair Isle Snowflake Stocking! I just love the festive snowflake design on this one. And I must say it looks really cute hanging with the Evergreen Stocking Pattern I shared earlier. If you missed my Evergreen Stocking Pattern, you can click here to get it now. Finished Christmas Stocking Crochet Pattern measures approximately 18.5 in. long and 5.5 in. wide. 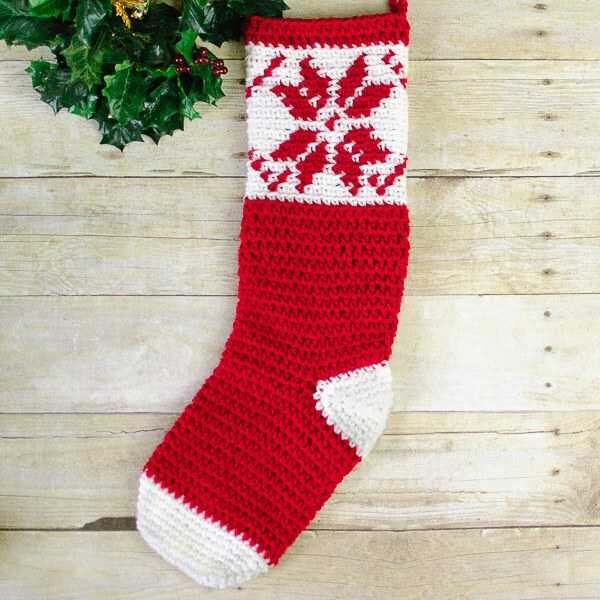 This Christmas stocking crochet pattern is not worked as conventional sock but instead is designed to lay nicely when hung. For best results when working the fair isle section of the pattern, work in back loops only as noted. For color changes, change color on the last yarn over of the stitch. See my tutorial How to Seamlessly Change Colors in Crochet for photos and more detailed instructions. Gauge: 14 hdc and 9 rows = approx. 4 in. Round 1: Work 2 sc in second ch from hook, 1 sc in each of the next 8 ch, 4 sc in last ch; rotate to work along opposite side of chain, work 1 sc in each of the next 8 ch, 2 sc in last ch, join with a Sl st in first sc of round – 24 sts. Round 2: Ch 1 (does not count as st here and throughout), work 2 sc in first st, 1 sc in each of the next 10 sts, work 2 sc in each of the next 2 sts, 1 sc in each of the next 10 sts, work 2 sc in last st, join – 28 sts. Round 3: Ch 1, work 1 sc in each st around, join – 28 sts. Round 4: Ch 1, work 2 sc in first st, 1 sc in each of the next 12 sts, work 2 sc in each of the next 2 sts, 1 sc in each of the next 12 sts, work 2 sc in last st, join – 32 sts. Round 5: Ch 1, work 1 sc in each st around, join – 32 sts. Round 6: Ch 1, work 2 sc in first st, 1 sc in each of the next 14 sts, work 2 sc in each of the next 2 sts, 1 sc in each of the next 14 sts, work 2 sc in last st, join – 36 sts. Round 7: Ch 1, work 1 sc in each st around, join – 36 sts. Drop CA but do not fasten off; carry CA up rows inside the stocking. Round 8: Join CB, ch 2 (counts as first hdc here and throughout), work 1 hdc in each st around, join – 36 sts. Rounds 9 through 19: Repeat Round 8. Round 20: Ch 1, work 1 sc in first st, ch 18, skip next 18 sts (for the heel), work 1 sc in next st, work 1 hdc in each of the remaining 16 sts, join – 36 sts. Leaving skipped heel sts for now, continue working pattern in sts and chains from Round 20. Round 21: Ch 2, work 1 hdc in each st around, join – 36 sts. Rounds 22 through 33: Repeat Round 8. Drop CB but do not fasten off; carry CB up rows inside the stocking. Work all stitches for fair isle section in back loops only. Change colors on last yarn over of stitch before color change. Round 34: Join CA in center st on backside of stocking, ch 1, work 1 sc in each st around, join – 36 sts. Rounds 35 through 47: Work in sc in back loops only following color changes in chart below. Round 34: With CA ch 1, work 1 sc in the back loops only of each st around, join and fasten off CA – 36 sts. Round 35: Join CB, ch 2, work 1 hdc in each st around, join – 36 sts. Round 36: Working back across sts just made, work 1 rev. sc in each st. Round 1: Join CA to first skipped st from Round 20, ch 1, sc2tog, 1 sc in each of the next 14 sts, sc2tog; rotate to work in bottom loops of ch from Round 25, sc2tog, 1 sc in each of the next 14 sts, sc2tog, join in first st – 32 sts. Round 2: Ch 1, sc2tog, 1 sc in each of the next 12 sts, sc2tog, sc2tog, 1 sc in each of the next 12 sts, sc2tog, join in first st – 28 sts. Round 3: Ch 1, sc2tog, 1 sc in each of the next 4 sts, sc2tog, 1 sc in each of the next 4 sts, sc2tog, sc2tog, 1 sc in each of the next 4 sts, sc2tog, 1 sc in each of the next 4 sts, sc2tog, join in first st – 22 sts. Round 4: Ch 1, sc2tog, 1 sc in each of the next 7 sts, sc2tog, sc2tog, 1 sc in each of the next 7 sts, sc2tog, join in first st – 18 sts. Round 5: Ch 1, sc2tog, 1 sc in each of the next 5 sts, sc2tog, sc2tog, 1 sc in each of the next 5 sts, sc2tog, join in first st – 14 sts. Round 6: Ch 1, sc2tog, sc3tog, sc2tog, sc2tog, sc3tog, sc2tog, join in first st – 6 sts. Fasten off leaving a long tail to sew hole closed, weave in ends. To make a loop to hang the stocking, join yarn to top corner, chain 10, St st back in same stitch as yarn was joined, fasten off, weave in ends to secure. 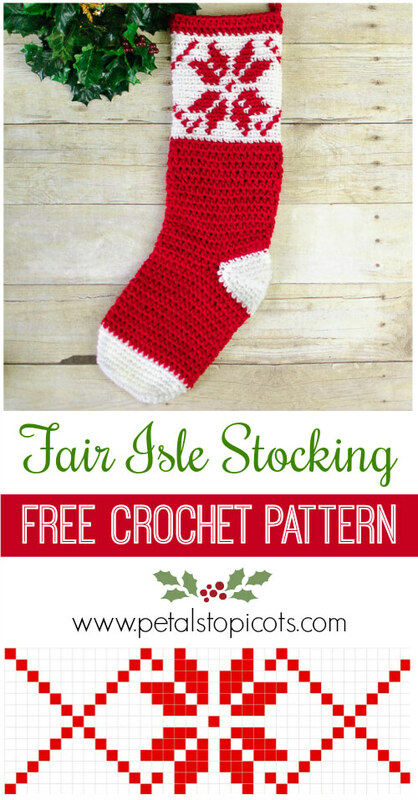 Ready for another free Christmas Stocking Crochet Pattern? 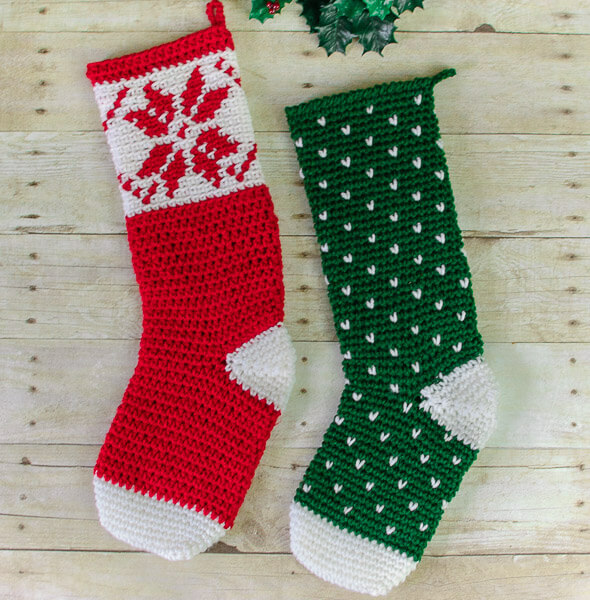 Stitch up this Evergreen Crochet Christmas Stocking Pattern. Or click here to see all my free Christmas crochet patterns. Which way are we suppose to follow the chart? I followed it from left to right but it should work out fine from either way. It’s a little confusing. I’m right handed, so I go right to left and I just wanted to know what to do.